The Sol suite is perfect for singles or couples wanting to stay right on the beach while vacationing at the beach. We are located on Potrero Bay which is the beach just north of Flamingo in the Guanacaste Province on the North Pacific side of Costa Rica. This suite has a gorgeous view of the ocean, beach, pool and great sunsets. Relax by the infinity lap pool or sit on the bar stools to watch the sun go down. We also have a gas grill for those impromptu BBQ's. Hammocks are available if you'd like to relax under the palm trees. The suite has a/c and a fully furnished kitchen. You can also watch cable TV or check emails with Wi-Fi. Just a 45 minute drive from the Liberia International Airport (LIR) and close to restaurants, grocery and shopping. We recommend renting a vehicle to fully enjoy the area. Infinity lap pool with swim-up bar and large rancho. Pool chairs and beach towels provided. We offer beautiful beachfront accommodation with an infinity lap pool. We’re located on Playa Potrero in Guanacaste and just 50 minutes from the Liberia International Airport (LIR). Villa Malibu is located in a residential area and offers a romantic, relaxing beach-side, exclusive vacation experience. On the beach and tucked away on a quiet side street, Villa Malibu is an upscale property with a studio suite. 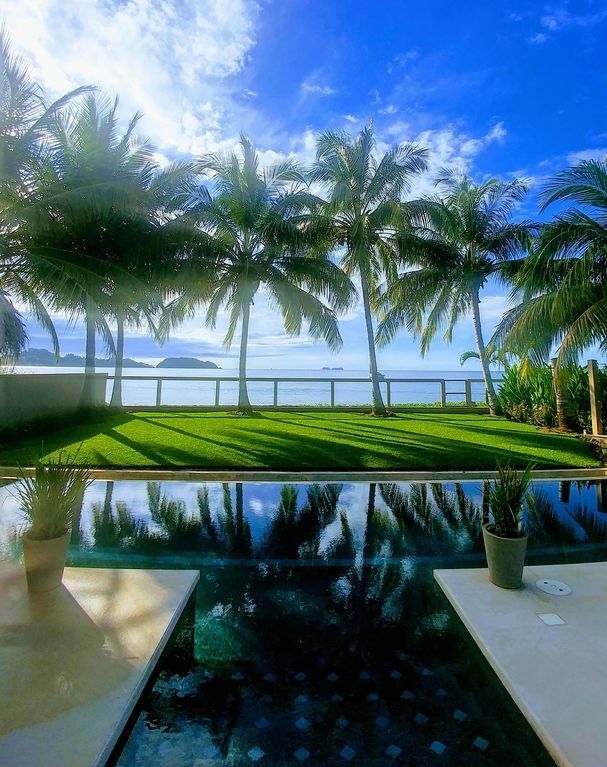 Guests of Villa Malibu enjoy the seclusion of a private tropical beachfront, but are only minutes away from some of the best dining and outdoor activities in the Flamingo, Brasilito, and Potrero area. We welcome guests from all over the world to enjoy the tranquility, comfort, and beautiful surroundings. The uniquely-designed Malibu-style property is a perfect place to escape from crowds to enjoy Costa Rica and rejuvenate your mind and body. Guests will also enjoy the spectacular beachfront pool. What a wonderful place for a honeymoon, anniversary, or even a wedding on the beach. -Beachfront property with an amazing sunset view -Onsite caretakers -Infiniti pool, grill, kitchen, TV, A/C -Nearby restaurants, ziplining, sunset tour trip access, deep sea fishing, live music, grocery stores, etc. -20-30 minutes from Liberia, CR airport -For advice, questions, & feedback feel free to contact us before, during, & after your visit. Our goal is to make your visit as special as possible. Quiet, not crowded beautiful dark sand beach - peaceful and beautiful! The location was perfect for us as we were able to walk to the sailing school/ center and rent a hobie cat sailboat for a couple of afternoons and walk down the beach to a restaurant for lunch or dinner as well. Our room was well equipped and well maintained, and the pool lovely, - we highly recommend villa Malibu! Great studio apartment right on the beach. Enjoyed the lap pool and being able to walk to restaurants on the beach. Beautiful sunsets! Thanks for a relaxing week. It's hard to say anything that hasn't already been said in other reviews. The pool was awesome, the grounds were awesome, Eddie and Angela were awesome, Bandida was the cutest and quietest dog you can imagine, and Jake was a great host. We had a great time at Villa Malibu. And the Potrero area is a great place to vacation at. Nice beaches and many good restaurants. We had an absolutely fantastic stay at Villa Malibu! The suite was perfect. The yard, pool and all amenities were exactly as we had expected. Thank you Lisa! We are glad you were able to enjoy your stay. We will be happy to have you back whenever you feel the need for some more warm weather and beautiful scenery! We thoroughly enjoyed our 18 days at Villa Malibu on Playa Potrero. This was our first visit to Costa Rica and we were hoping to find a beach where we could spend a lot of time swimming, walking and relaxing after a long winter. We could not have been happier with our choice of location and accommodations. Our typical day consisted of a long walk on the beach, several swims in the ocean, each one followed by a dip in our own personal salt water pool, and a late breakfast or late lunch at one of the wonderful nearby restaurants. Our days would wind down with sunset drinks by the pool or on the beach, then sleeping to the sound of the waves. We took a few excursions but enjoyed Playa Potrero more than any other place. The apartment is small, very clean, nicely appointed and well equipped. The grounds are beautiful and meticulously maintained. Laura was there for our first week to help orient us and always ready to join us for a walk and swim or poolside conversation. The caretakers, Eddy and Angela, kept a low profile but graciously allowed us to engage them in conversation with our limited Spanish when we did see them. In our opinion, Playa Potrero is the best beach in Guanacaste and Villa Malibu is the best place on the beach! It was a true pleasure to have you as our guests. Thank you for the 5 star review and hope you can return very soon. A wondrous Piece of Paradise! My sidekick and I booked 5 days at Villa Malibu and from the moment we arrived on the property we were in love. Everything about the home was perfect, from the bright and lovely room to the sweet little "Binga" (dog) that patrolled the yard. The salt water pool and lounging area was fit for a queen and I truly felt like one as I lay by the pool enjoying cool cocktails and a good book. The property is spacious and immaculately kept, with the caretakers living on property and ensuring all is well. Laura, the owner was a gem full of great knowledge on the area, including great places to eat and drink. Although the owner and caretaker were on property, we never felt like our time was compromised as they respected that this was our vacation time and left us on our own unless we requested their input. The last night with Laura, Eddie and Angela was amazing as they built a huge bonfire on the beach for our last sunset. If you stay in Protrero, you must stay here! Thank you for the 5 star review. We thoroughly enjoyed having you and your sidekick stay with us. Hope that you both can return soon in the near future. Thank you for choosing to stay at Villa Malibu. 50% refund available upon cancellation. Rates subject to change without notice.